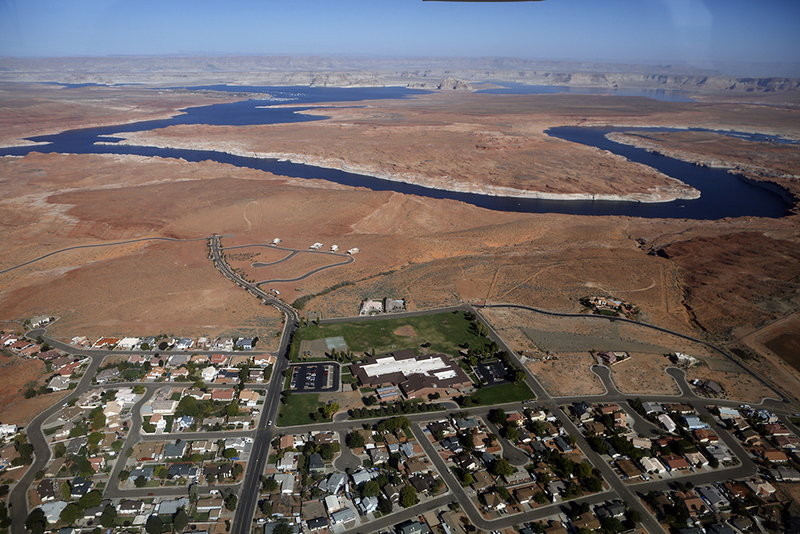 Lake Powell and nearby suburbs are seen from an Eco-Flight plane that gives tours to students who want to learn about water and energy issues along the Upper Colorado River. A new research group argues that conversations about the river’s future must first begin by acknowledging the fact that demand already exceeds supply. Click image to enlarge. I have been reporting on Western water issues – specifically the Colorado River Basin – since 2009. Over the past five years, the question of how to meet current and future water needs in the iconic watershed has taken on new urgency as a long drought and steady water consumption sap both reservoirs and aquifers. Typically the debate is one of bridging the gap between expected demand and a shortfall in supply. The Colorado River, sometimes called the American Nile, has nurtured more than a century of agricultural and urban growth in the desert Southwest. Restrained by dams and diverted by a web of canals, the canyon-carving icon supports enough irrigated farmland to cover all of New Jersey in rows of lettuce, tomatoes, and alfalfa. Residents of Albuquerque and Los Angeles, Denver and Salt Lake City – none of whom live within the physical boundaries of the Basin – are among the 40 million people who drink Colorado River water from their taps. The Basin’s megadams, Hoover and Glen Canyon, are essential assets for balancing the region’s electrical grid and provide cheap hydroelectric power to millions. We’ve done a lot of reporting on the Colorado River Basin. Check out all the links above for more info, and see all our #CORiver reporting here. The research group is a pet project that Kenney, the director of the Western Water Policy Program at the University of Colorado, Boulder, has been pondering for two years. A grant from the Walton Family Foundation – no relation to me – gave life to the vision, and this fall Kenney began handpicking his research dream team. Each of the 10 members that he selected is a respected scholar with decades of experience studying the Colorado River. Their expertise strikes at all angles – public policy, law, hydrology, water management. Kenney’s inspiration came from another arid river basin, Australia’s Murray-Darling, a watershed that crashed during the horrendous Millennium Drought of the first decade of this century. In those bleak years, the Wentworth Group, a collection of scientists – “esteemed people with clout,” as Kenney put it – came together to guide political leaders through the crisis. “It looked like they helped steer the conversation in a productive way,” Kenney explained. 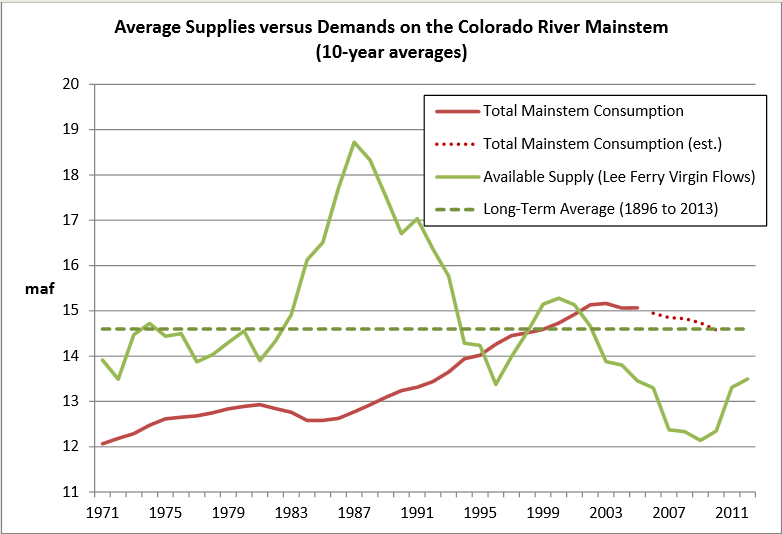 Water use in the Colorado River Basin surpassed the long-term average annual supply in the late 1990s. Click image to enlarge. For Kenney’s group, the conversation begins with the idea of limits. Going by the long-term historical record (1896-2013), water use in the Colorado River Basin began outstripping the average supply in the late 1990s or early 2000s. The Basin has since endured the driest 14-year period on record by depleting its two huge reservoirs, Lake Mead and Lake Powell. With both lakes less than half full and with the knowledge that river flows will likely decrease even more as the planet warms, a continuation of past water-development policies seems absurd. Yet the group’s goal of redirecting water policy in the Southwest will be a formidable challenge. Earlier this year, I spoke with officials in each of the four Upper Basin states: Colorado, New Mexico, Utah, and Wyoming. According to legal tradition, the Basin is divided in two, and each half is granted by treaty the use of 7.5 million acre-feet of water from the river. The Lower Basin – the states of Arizona, California, and Nevada – is already using its full allocation. The Upper Basin – Colorado, New Mexico, Utah, and Wyoming – is using roughly 60 percent of its share, but all four states are planning to pull more water from the river, to use for irrigation or urban growth, energy development or water rights settlements with Indian tribes. All of the water officials that I have interviewed recently about this issue told me that they were thinking about the risks involved but that the existence of risk alone would not cause them to shy away from a project. As more water is used, the potential for a shortage increases, but each state will determine its own acceptable level of risk. It is this lack of Basin-wide perspective that Kenney says is missing in these debates about new withdrawals. Each project is analyzed individually, but the accumulation of such diversions will – drop by drop – magnify the risks for everyone. If not more diversions, where does new water come from? Kenney is careful to point out that the principle of less use does not mean a grounding of the region’s economy. Embracing a less-is-more frugality has a way of generating creative responses to increase efficiency and wring out the waste from the system – an idea that any college student on a budget would understand. To that end, Kenney said his group will be publishing short policy briefs every couple of months that will address the benefits of these water-saving adaptations – measures such as transfers of water between farms and cities, fallowing farmland, and irrigating with less water. Beyond the policy briefs, Kenney is not sure where the group’s path leads. “We’re still evolving,” he said. I will be following Kenney and his group in the coming months. What other groups are doing interesting work on the Colorado River? Contact Brett Walton, or via Twitter at @waltonwater, or use the comment form below. The graphic should be up to date, and show data at least up to year end 2013. The impression given is that the numbers require some delayed tallying. As you know, the reality is that consumption is measured in real-time, and the data publicly disseminated on a daily, weekly and monthly basis on numerous government and user group websites. Recently, a published study showed that California’s drought was the worst three year drought in 1200 years. The fact that life in the Desert South Western US even goes on, without experiencing a collapsing economy, or a mass exodus of the population, is testament that cooperation, planning, and management of this limited resource, is working. As always, thank you for your insightful reporting on these water issues.